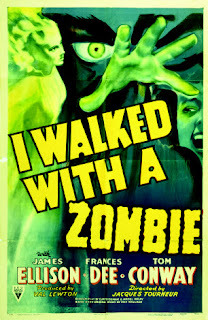 Today, 1943's I Walked with a Zombie. I Walked with a Zombie was the second film producer Val Lewton made under his deal to churn out a series of low budget horror movies for RKO. The three conditions established when the deal was made remained in place: RKO would provide the titles for Lewton to make a story out of, the movie couldn't run over 75 minutes, and the budget had to be under $150,000. Post-production wasn't even complete on the first movie under the deal, Cat People (1942), when RKO told Lewton what the title of his second movie would be. The title wasn't all there was to I Walked with a Zombie when RKO brought the project to Lewton, he was also given some source material to pull ideas from, a series of articles written by Inez Wallace, published in the pages of American Weekly, wherein she gave a firsthand account of voodoo practices in the West Indies. 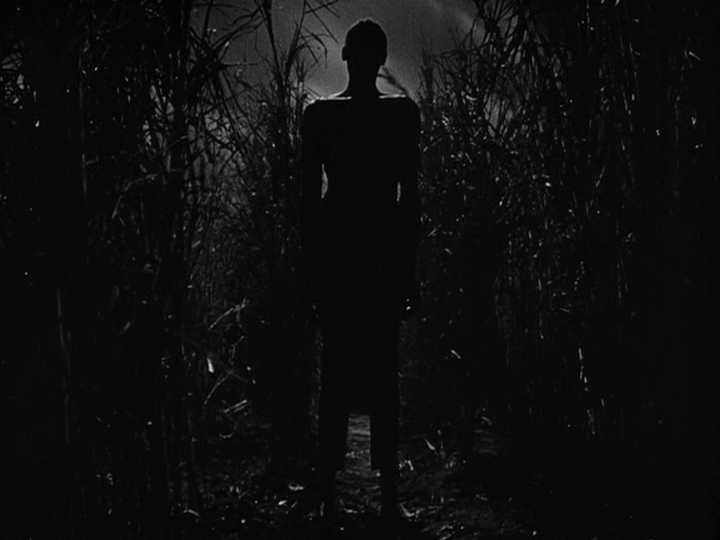 Further research was done into voodoo, information on how to portray one ritual within the film was taken from a Life Magazine article, and Lewton is said to have advised screenwriters Ardel Wray and Curt Siodmak (who had several genre credits to his name, including 1941's The Wolf Man and Frankenstein Meets the Wolf Man, released the same year as this film) to mix the voodoo angle into a story structure inspired by Charlotte Brontë's novel Jane Eyre. Betsy finds her destination beautiful, but her employer Paul Holland warns her that there's no beauty on or around St. Sebastian, only death and decay. Holland's wife Jessica is Betsy's patient, and she is a zombie. Not of the flesh eating sort, they weren't making those kind of movies yet. A tropical fever burned out Jessica's spinal cord, leaving her unable to speak and without any willpower of her own. While seemingly conscious, she's like a sleepwalker who can never be awakened. Like Robert Palmer sang, "The lights are on, but you're not home." As her time at the Holland plantation goes on, Betsy finds herself in a sort of love square with Holland, his zombie wife, and Holland's borderline alcoholic stepbrother, who seems to have had something going on with Jessica before her fever struck. Also living on St. Sebastian is the brothers' mother, played by Edith Barrett, aged up with makeup to play much older than her actual thirty-six. At the time of filming, Barrett was in the midst of a ten year marriage to Vincent Price, who was still several years away from becoming a horror icon. Beyond the sugar-growing family, the island seems to be almost entirely populated by the descendants of the slaves previous generations of the Hollands brought to the island to work in their cane fields. Voodoo is the religion of most of the islanders, and the sound of the drums from voodoo ceremonies often fill the air. Betsy struggles with the love she develops for Paul Holland, and since he remains devoted to his wife she decides that if she can't have him, she'll make him happy by returning his wife to him. She tries to figure out how to reverse Jessica's condition, and is eventually convinced to give voodoo a try. 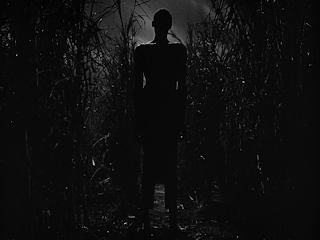 This brings about the best sequence in the film, when Betsy leads the zombie Jessica through the cane fields on a dark and windy night, past the towering, bug-eyed guardian zombie Carrefour, on the way to the voodoo temple. 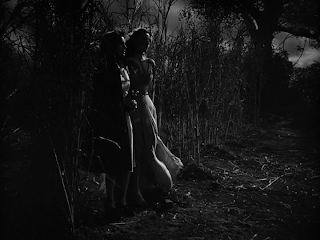 Cat People director Jacques Tourneur reteamed with Lewton on this film, and as with CP he provided I Walked with a Zombie with gorgeous black and white photography and a brilliant use of light and shadow. The sound design on this film is also fantastic, with the drums echoing around the island and the eerie wind. IWWAZ features some great music as well, there's a calypso song about the Hollands, "Shame and Sorrow for the Family", that's performed by a singer called Sir Lancelot, as well as a ceremonial song performed at the voodoo temple. Both of these songs are very catchy, both got stuck in my head. I was whistling and singing one all evening after watching the movie and woke up with the other one running through my brain the next morning. I Walked with a Zombie is a very good movie, although it leans heavily toward the dramatic aspects and there isn't a lot to keep a modern horror audience's attention for most of the running time, which is still a breeze at just under 69 minutes. I didn't get much out of the film when I first watched it in 2003, but have grown to like it more over time. I do think that RKO's "knock out a cheapie to make some quick cash" intentions show a bit more this time than they did on Lewton and Tourneur's previous film, this one is more simplistic and seems to be lacking in some way that I can't really describe. But it's worth checking out.